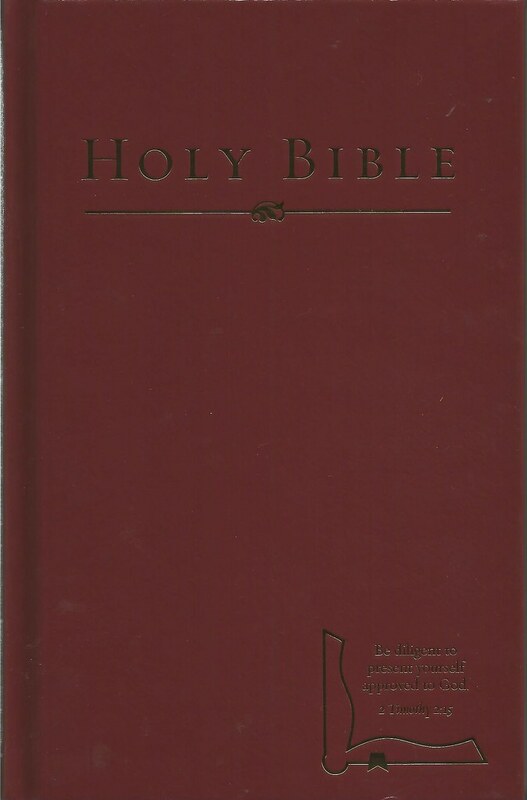 References: Taliaferro-BVE CN00062, Taliaferro-EELBV 8885. 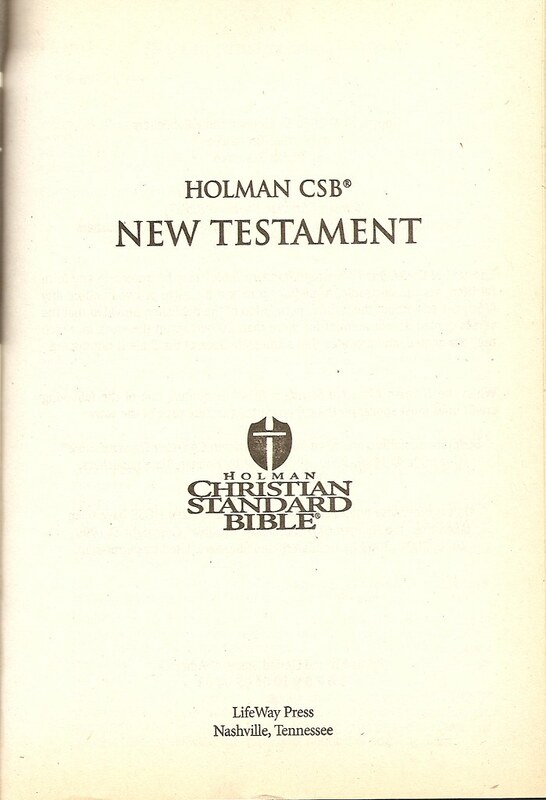 This section is for New Testaments printed before the HCSB was completed in 2003. 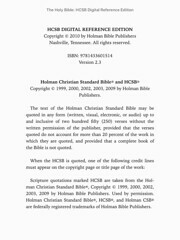 Comments: The HCSB text has a 2002 copyright date. 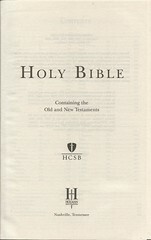 This edition also contains annotations and page numbers in Romans that explain the Romans road to salvation. 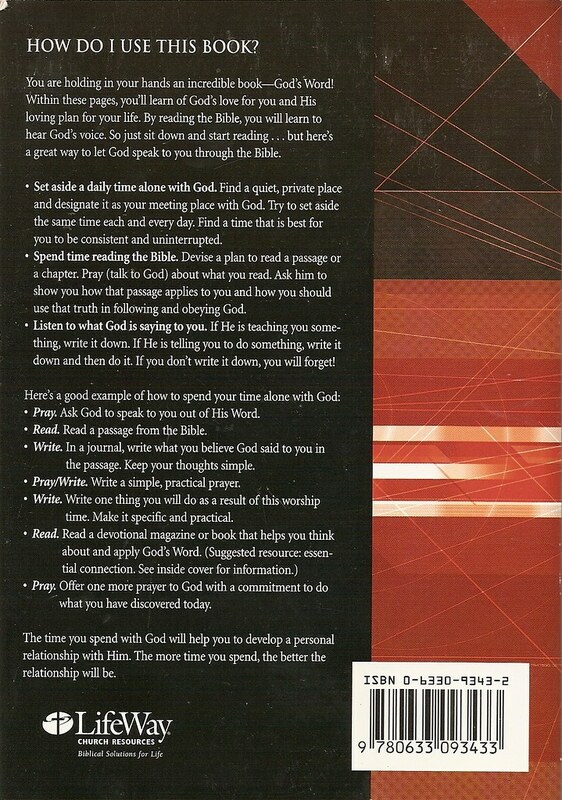 These notes cover Romans 1:16, 2:4, 3:23, 5:8, 6:23, 10:9-10 and 10:13. 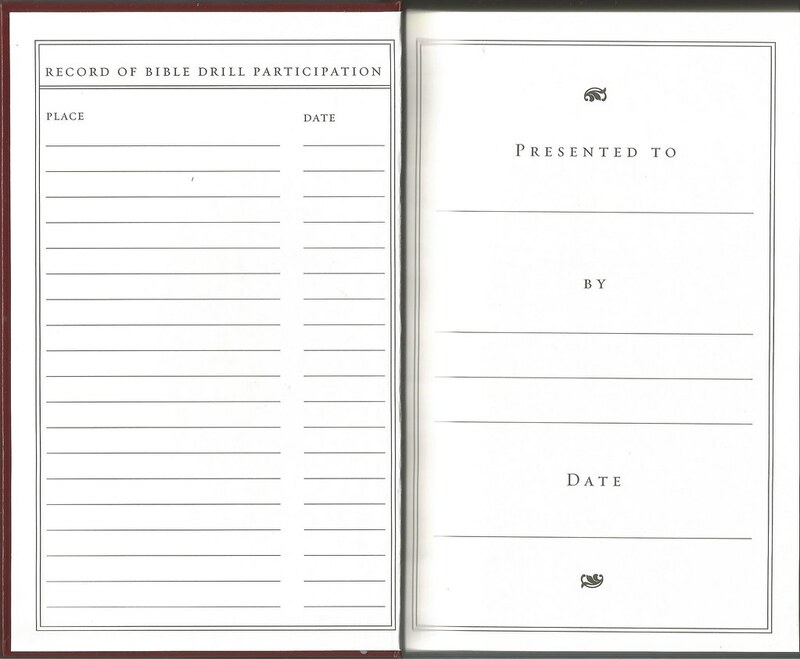 Space is also provided for the reader to record their decision for Christ. 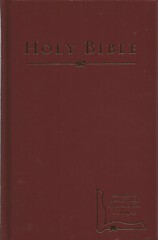 References: Taliaferro-BVE CN00062, Taliaferro-EELBV 8885.090. 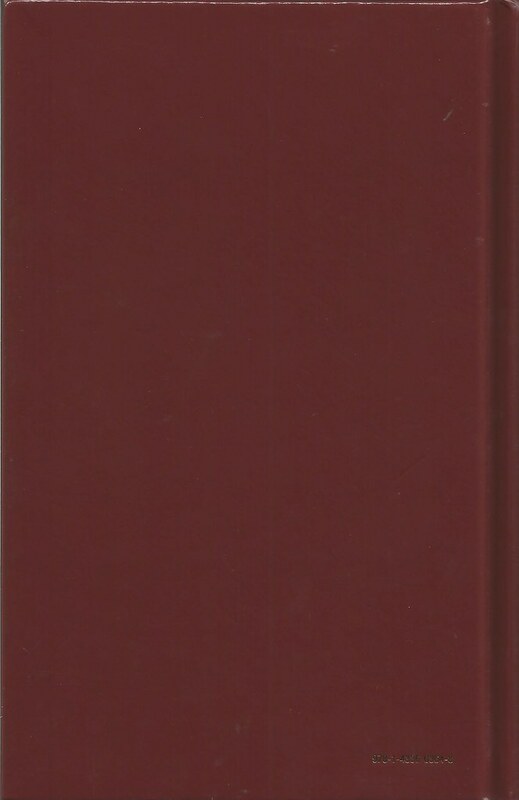 References: Taliaferro-BVE CN00062, Taliaferro-EELBV 8885.100. 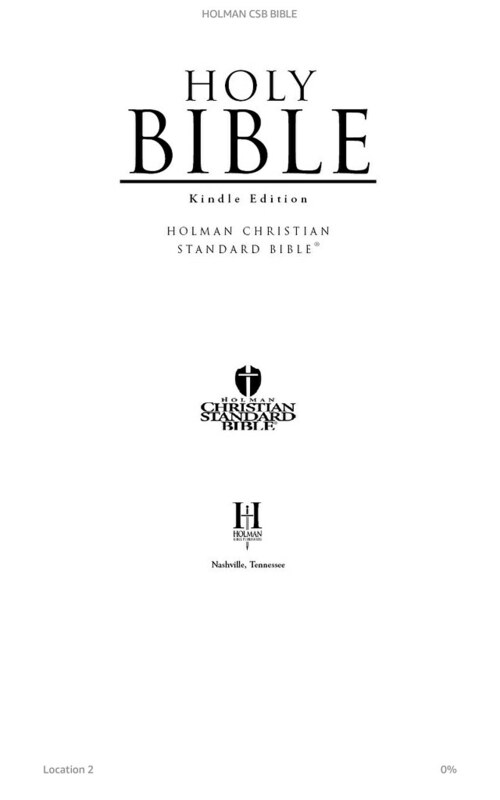 Comments: This is the Amazon Kindle edition; the Amazon listing for this edition has a 2007 date. 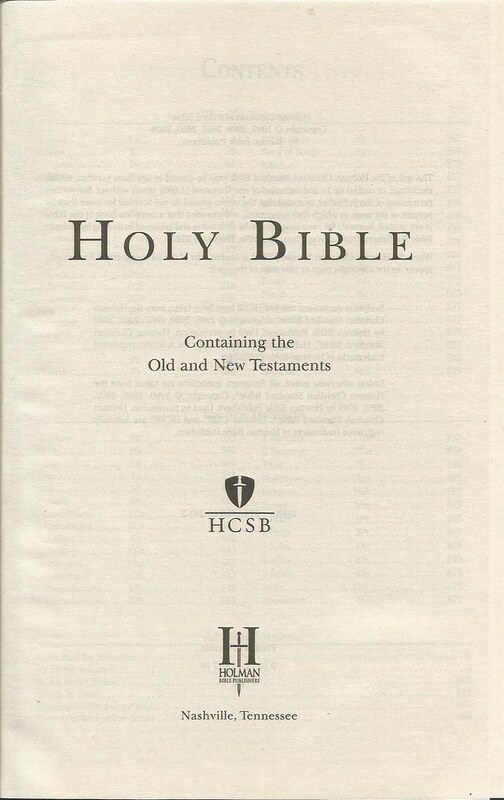 Comments: This Bible was printed in Korea; it is an economy edition. 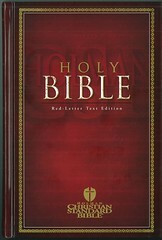 Besides black, it is available in burgundy, white and blue. 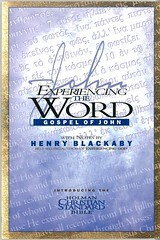 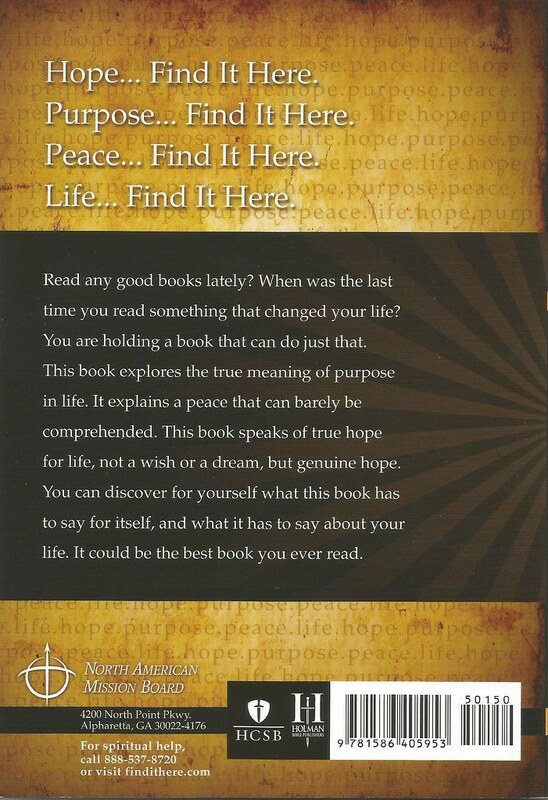 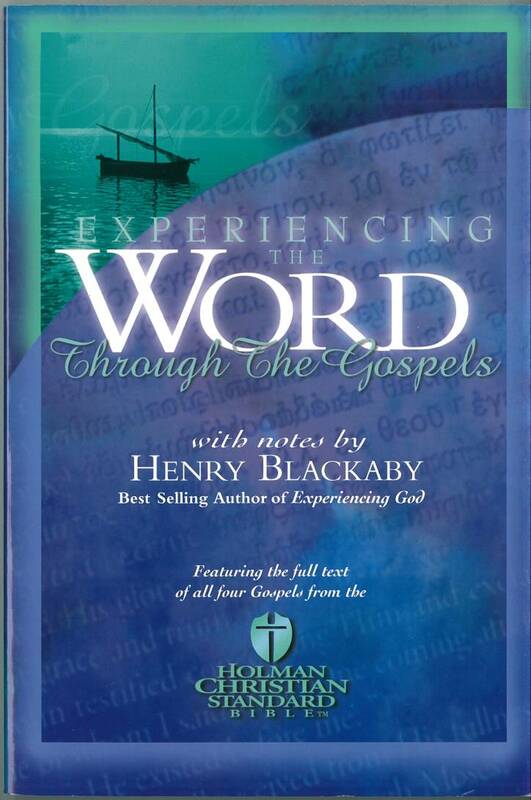 An illustrated edition that shows Jesus teaching is also available. 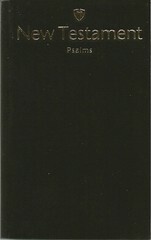 Facsimile: A facsimile is at archive.org. 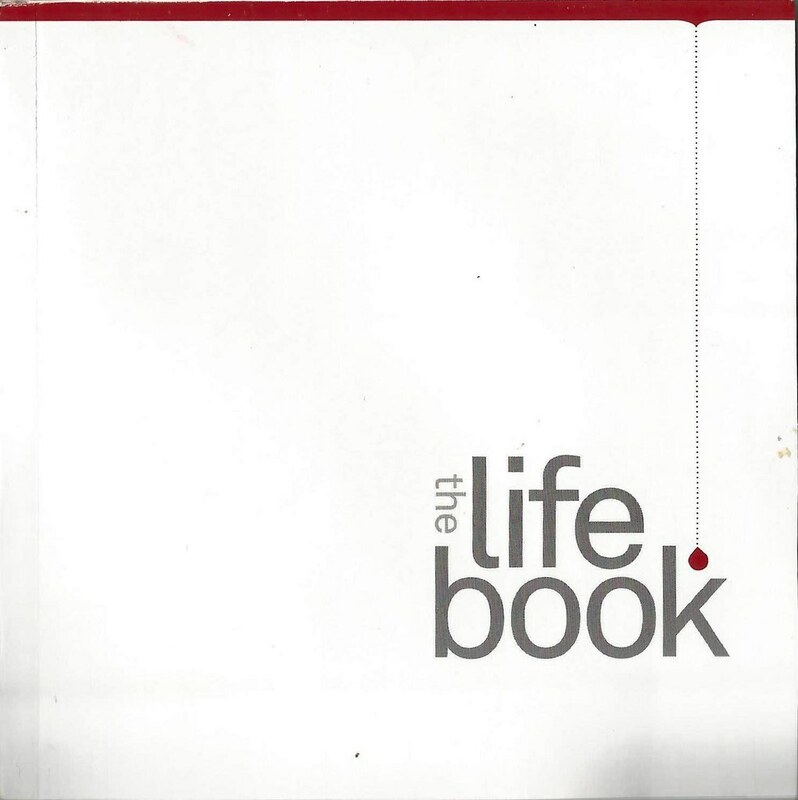 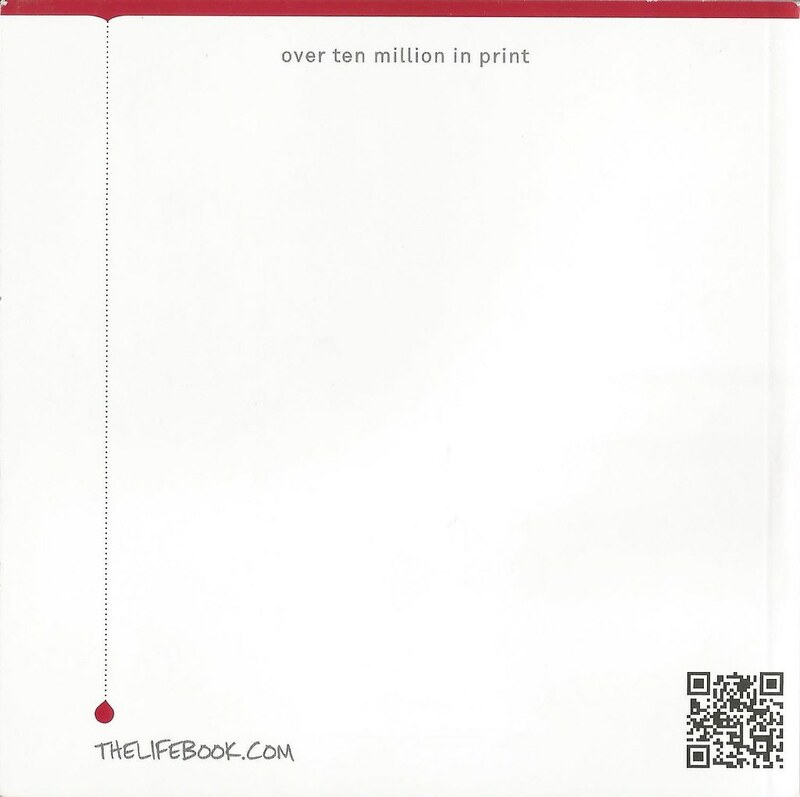 Comments: The Life Book was founded by The Gideons International; it is an edition of the Gospel of John designed to help teenagers share the gospel with their peers. 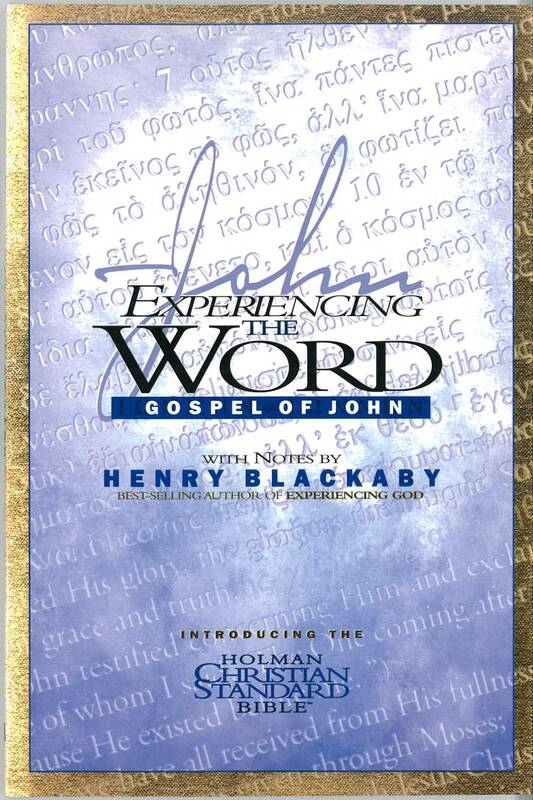 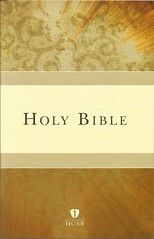 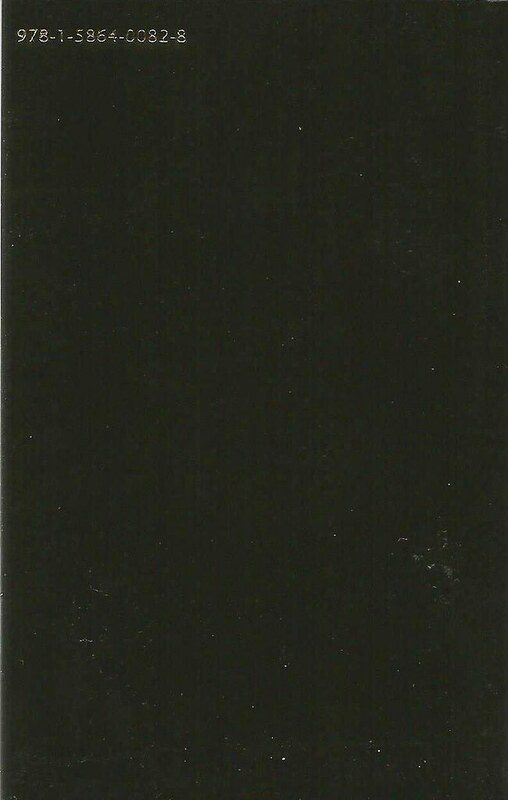 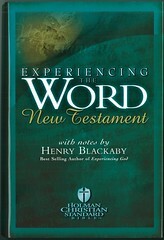 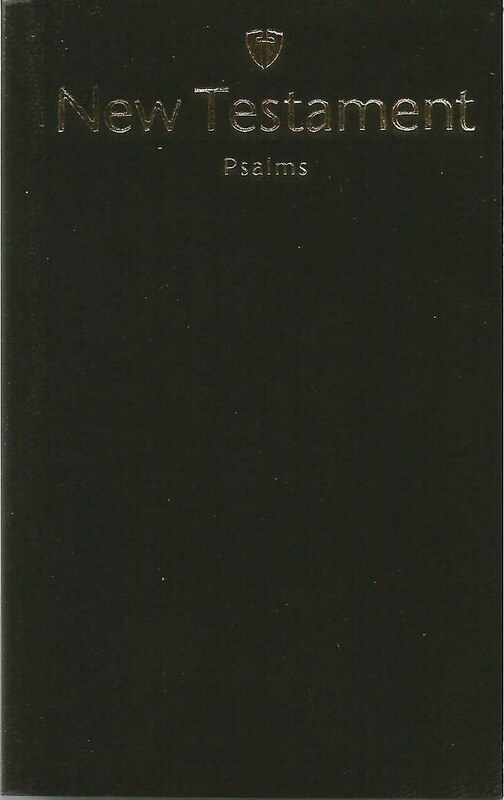 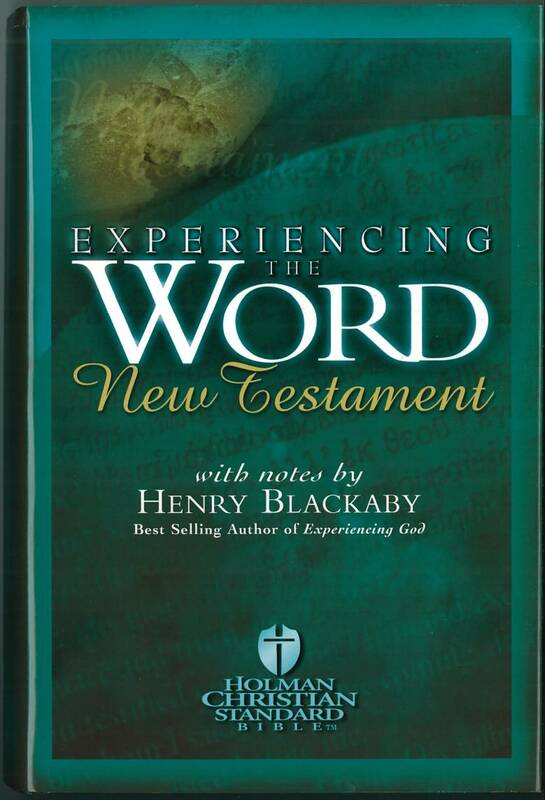 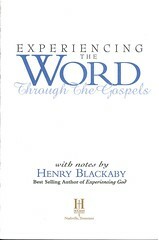 An English Standard Version edition was published in 2013. 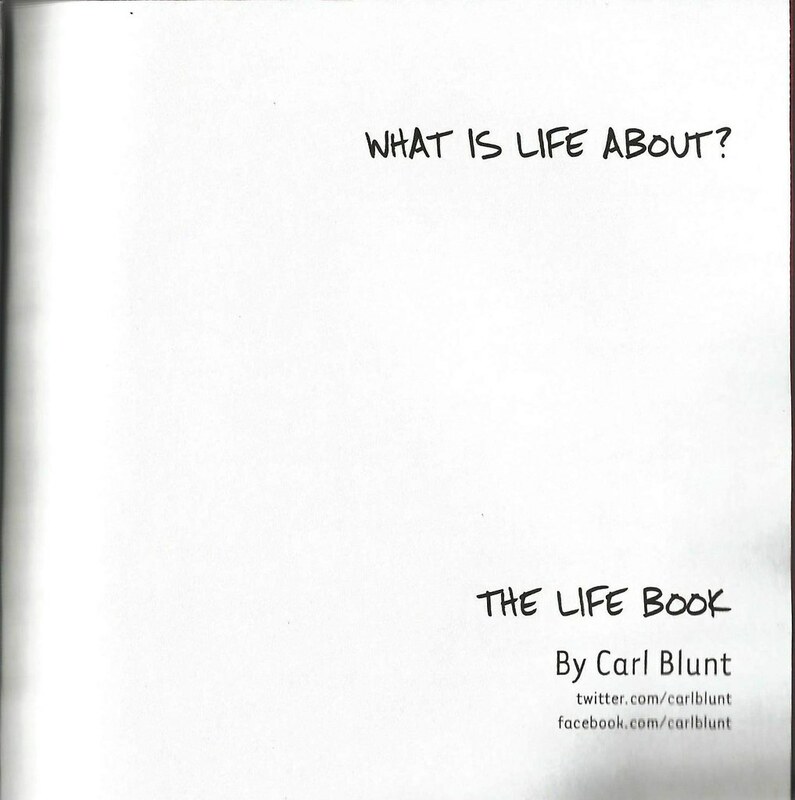 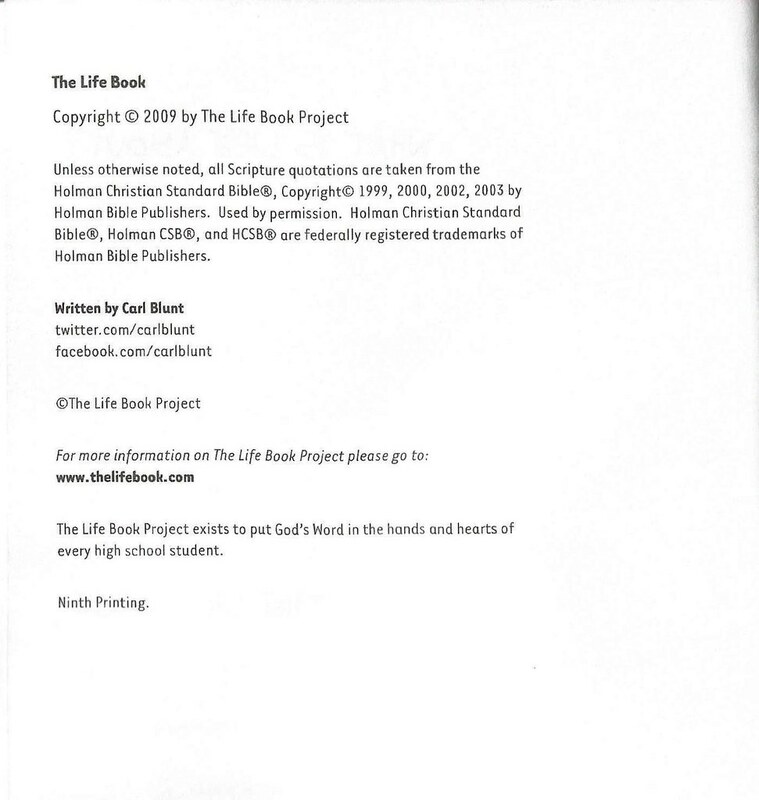 More information can be found at http://thelifebook.com. 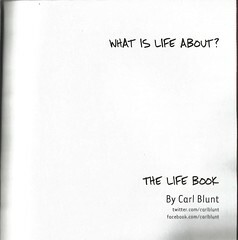 Comments: Gift & Award edition. 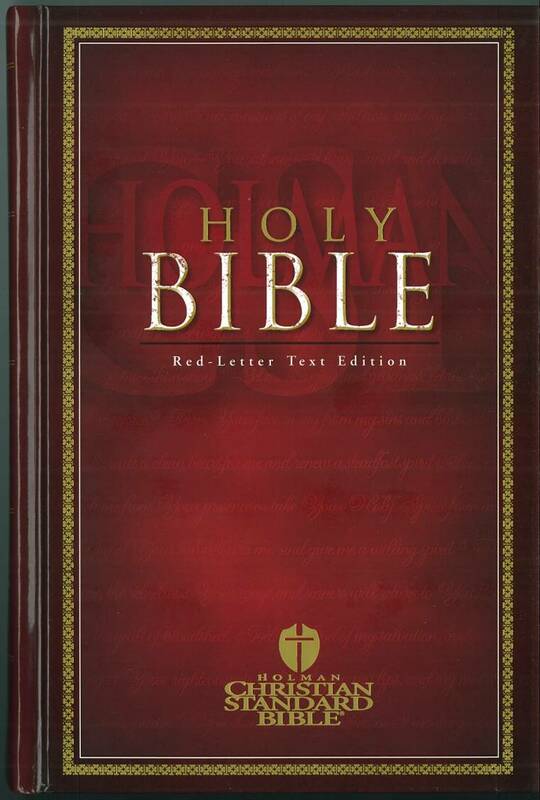 Besides burgundy, this Bible comes in red, black and blue. 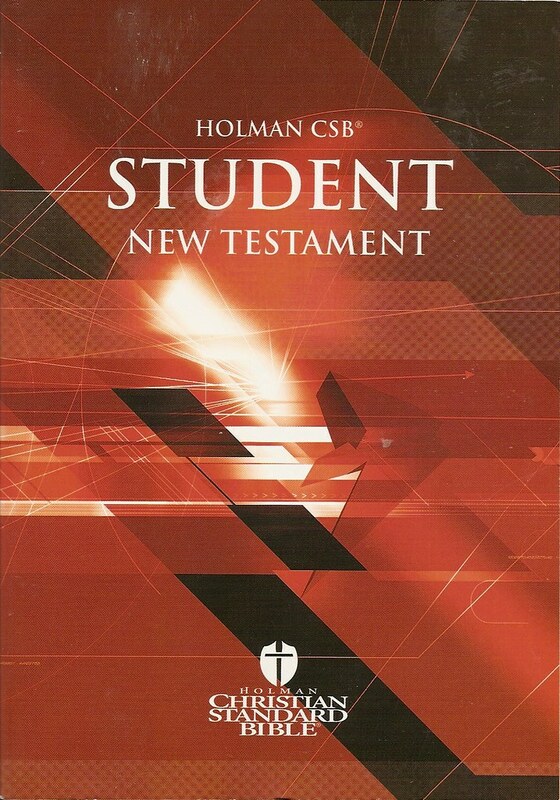 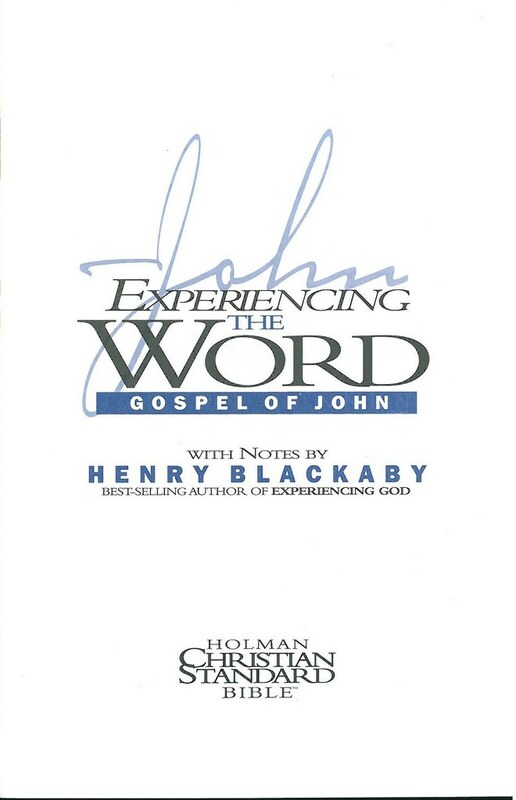 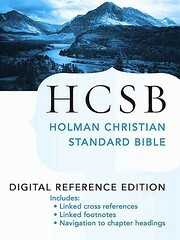 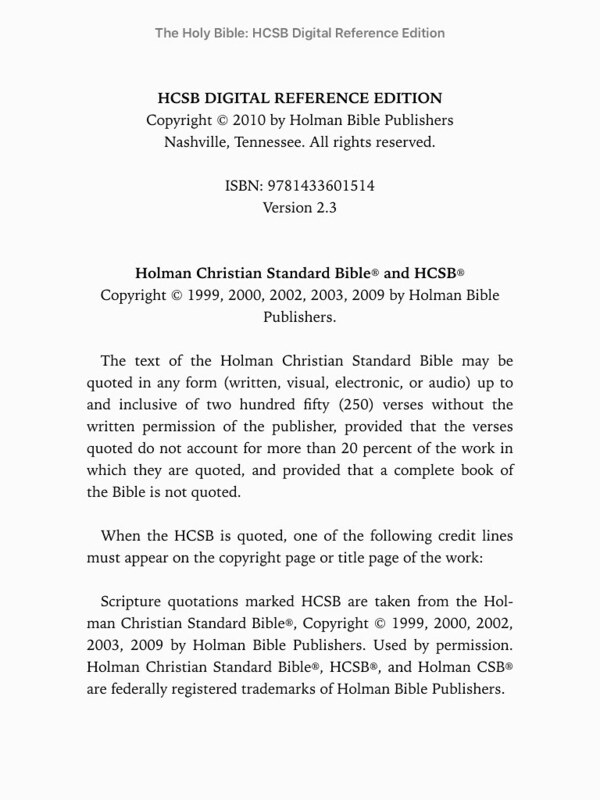 The 2009 revision of the HCSB comes in two different editions. 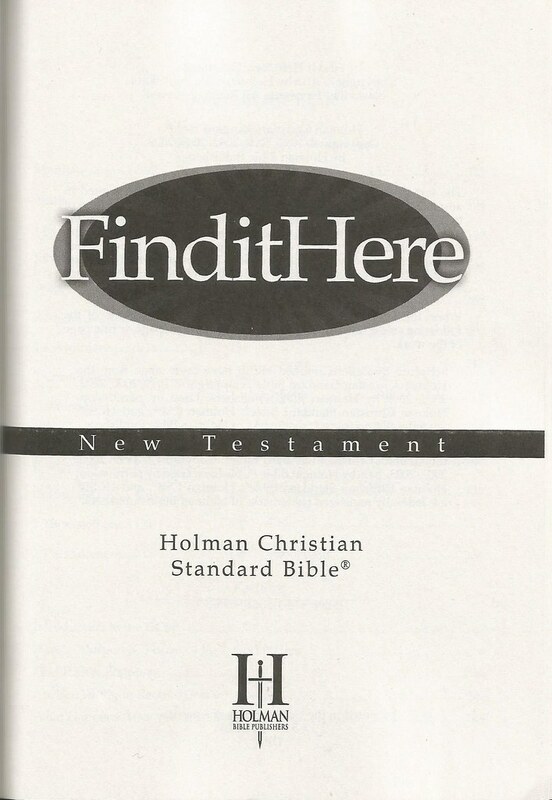 One has the text only; the other has the text and various helps. 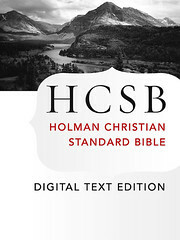 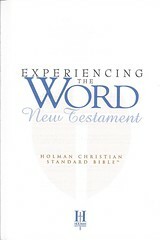 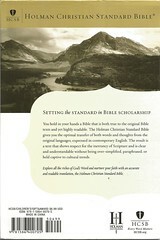 Comments: This is the Amazon Kindle edition; it contains the complete HCSB text and the bullet notes glossary. 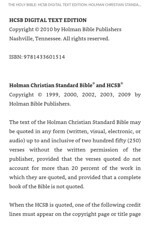 Footnotes and cross references are not included. 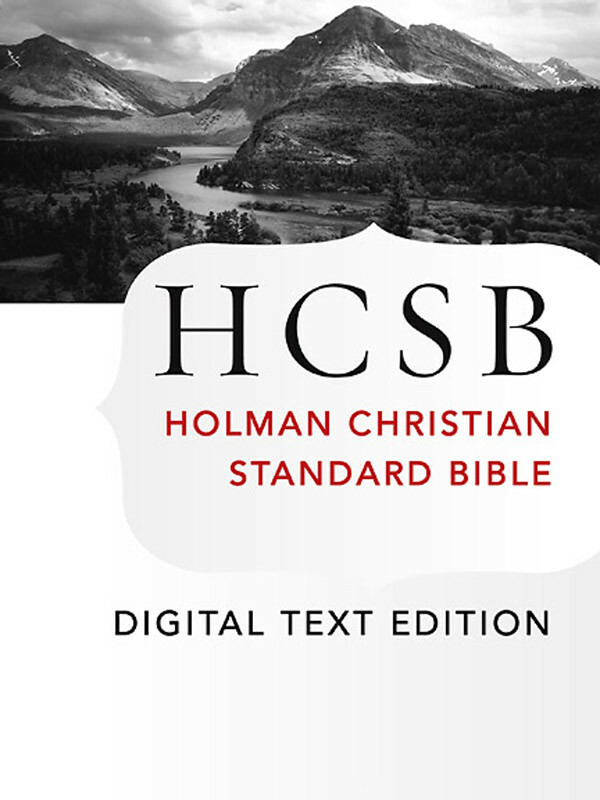 Comments: Version 2.3; this is the Apple iBooks edition; iBooks is available for the Macintosh, iPhone, iPad, and iPod touch devices; it contains the complete HCSB text. 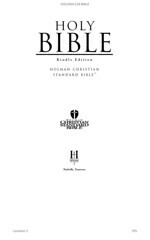 The bullet notes glossary, footnotes and cross references are also included. 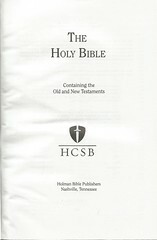 This edition is for Bible drills. 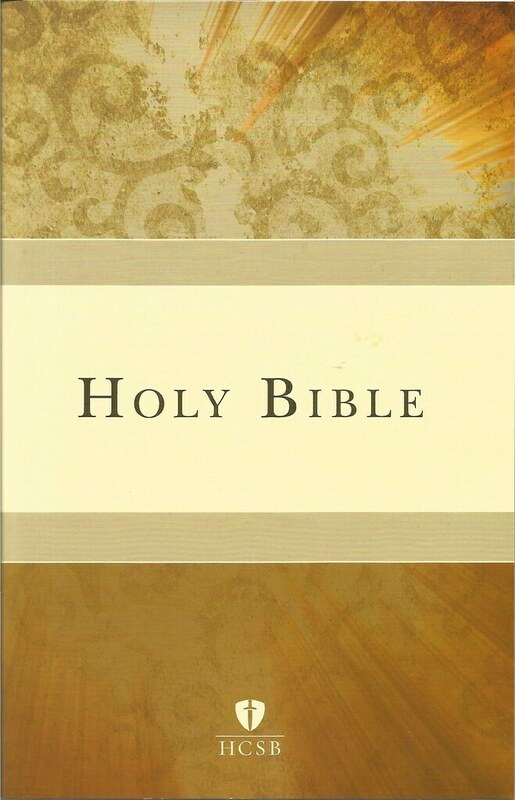 These events help children memorize the books of the Bible and selected verses. 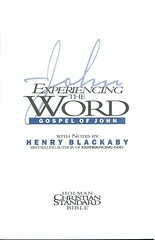 The California Southern Baptist Convention has more information here. 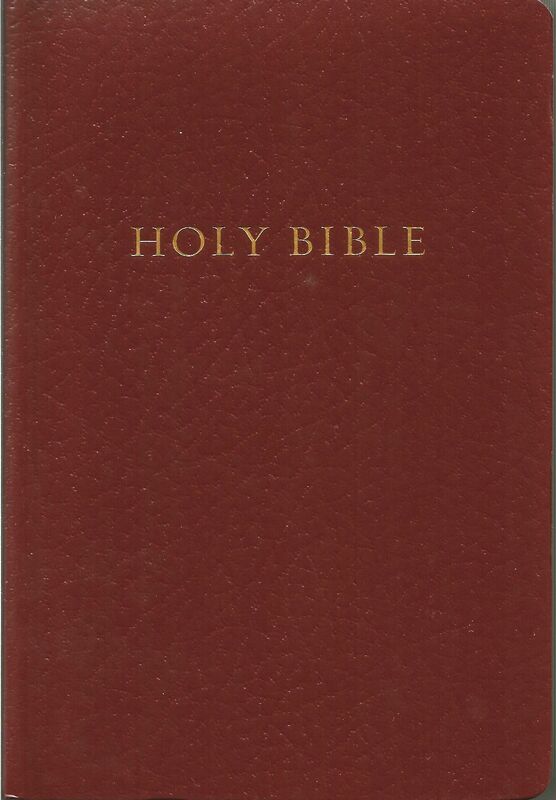 Comments: The front cover has 2 Timothy 2:5a (Be diligent to present yourself approved to God.) 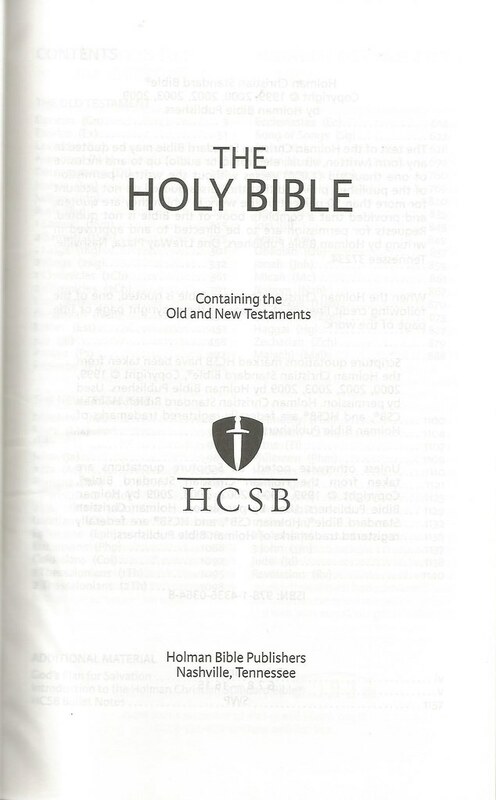 and a drawing of an open Bible engraved on the bottom right hand corner. 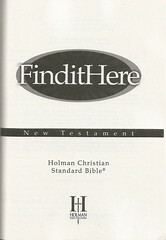 The inside has a space to list Bible drills and a presentation page; it can be seen here. 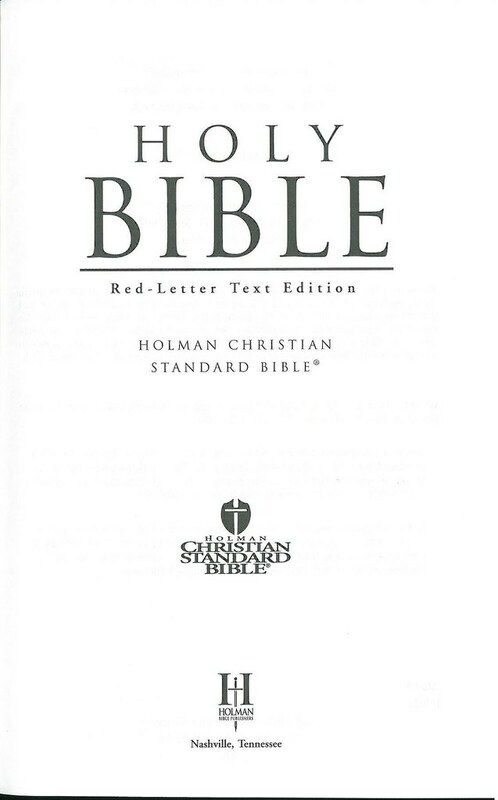 The bullet notes glossary is printed; footnotes and cross references aren't included. 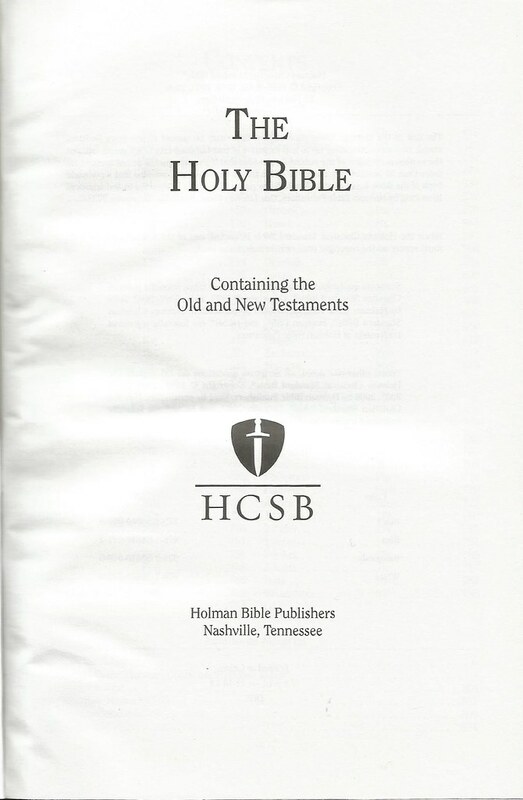 Comments: This is an outreach edition released in 2012; it was only available at LifeWay bookstores. 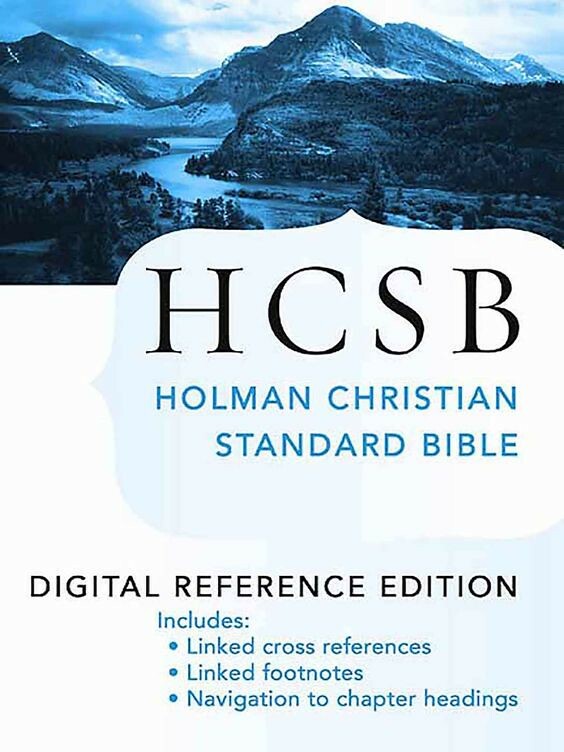 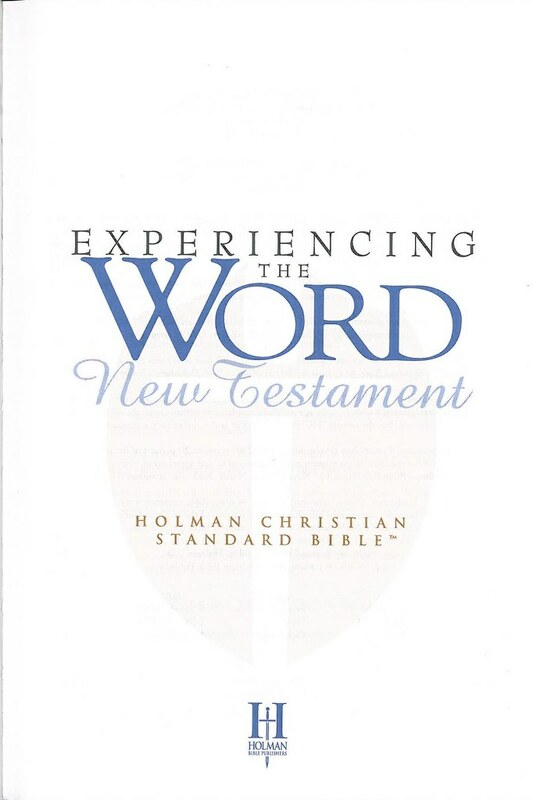 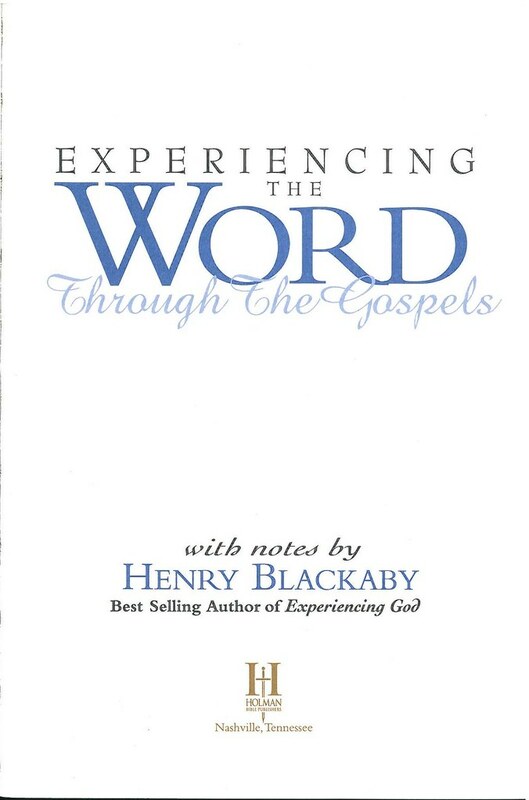 Besides the HCSB text and the bullet notes glossary, a section of Frequently Asked Questions, a reading list and "where to turn" section is included. 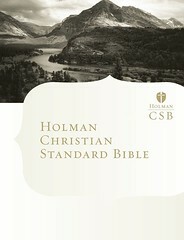 More information about this edition is here. 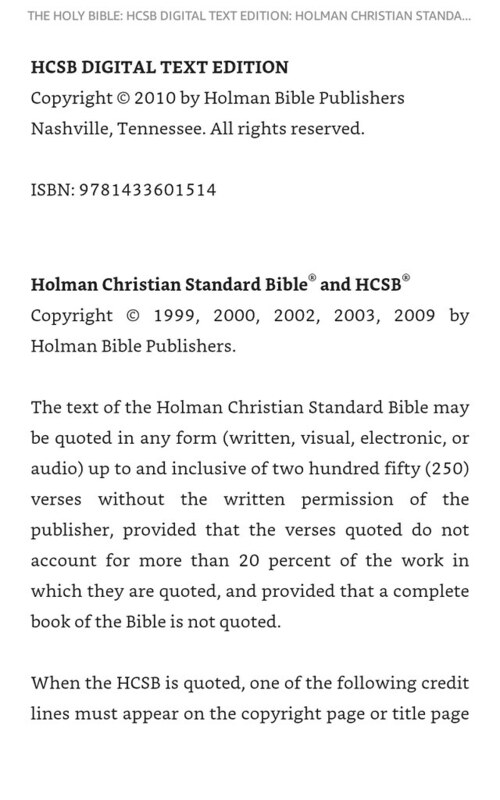 Footnotes and cross references are not printed. 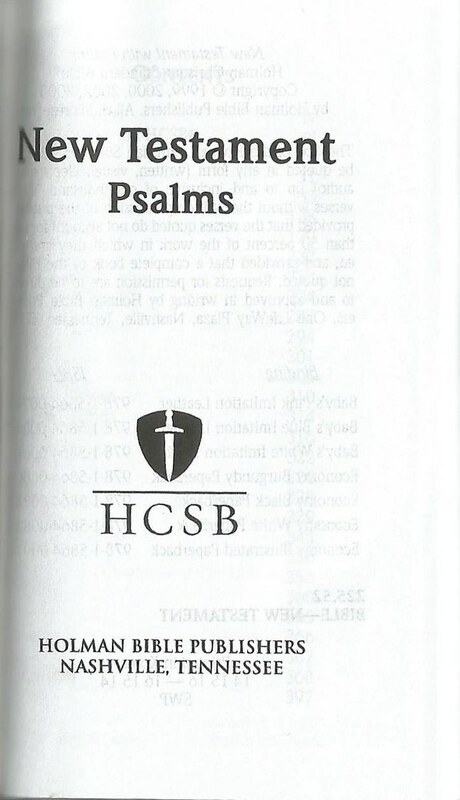 Comments: This edition was published for the North American Mission Board of the Southern Baptist Convention. 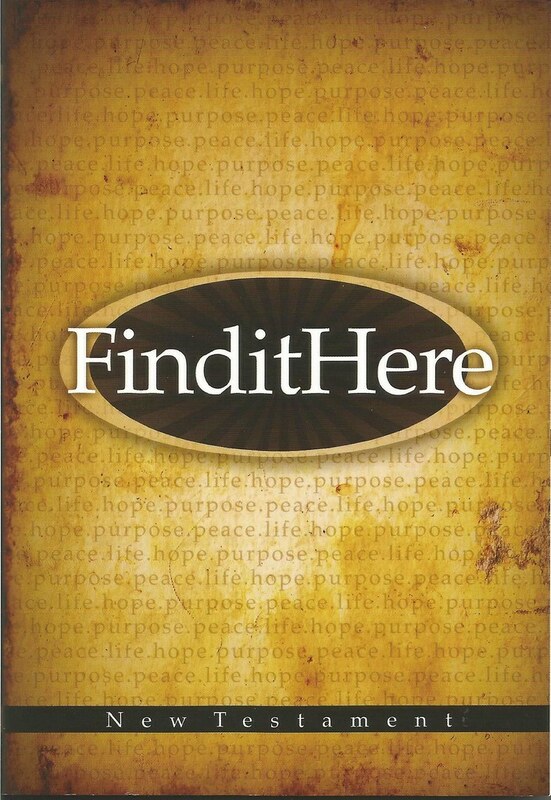 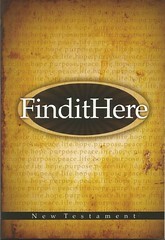 It promotes findithere.com; this website has answers to questions, a church finder and videos. 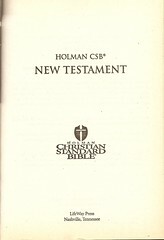 This edition also contains annotations and page numbers in Romans that explain the Romans road to salvation. 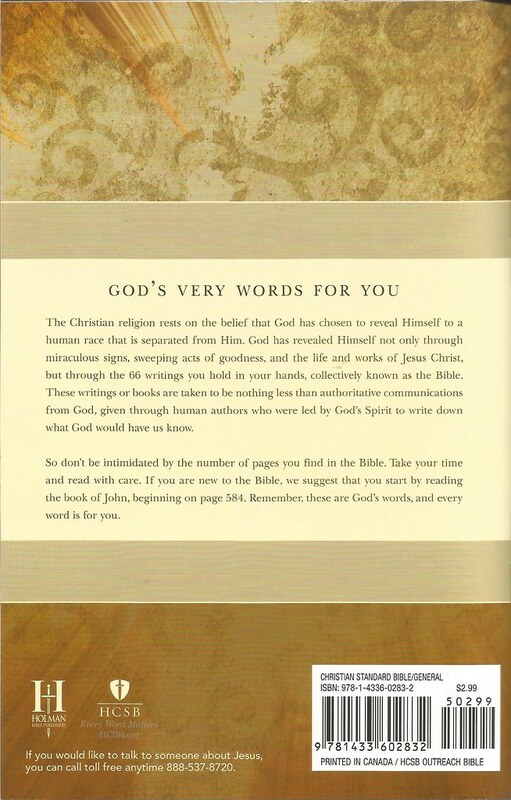 These notes cover Romans 1:16, 2:4, 3:23, 5:8, 6:23, 10:9-10 and 10:13. 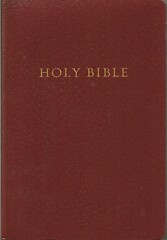 Space is also provided for the reader to record their decision for Christ.